From the archives. Just wanted to mention that I still love this butter, plus The Body Shop recently lowered the Canadian prices by a couple bucks, to reflect how well our dollar is doing. Still a splurge, but at least they tried! 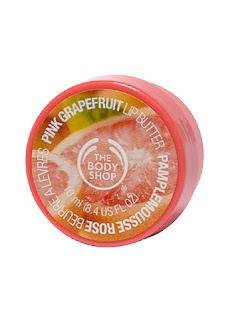 A few quick words about the Body Shop's new Pink Grapefruit stuff. I am already addicted to the shower gel in this line, so I was super excited to see that they were coming out with the corresponding body and lip butters. First, the Body Butter: MMMMMMM! The consistency is similar to many of the other body butters (perhaps a tiny bit lighter and more gel like), but the smell! It's incredible -- they've captured the sweetness of pink grapefruit, and balanced it out perfectly with a salty tang. Yes, you read right, SALTY. It's subtle, but it totally sets the scent apart from the millions of other pink grapefruit products out there. It is as refreshing and zippy and summery as a Seabreeze, and The Boy goes "Oh my god you smell so good" without fail whenever I use it. Total winner. 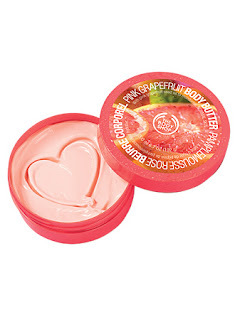 I wish I loved the Pink Grapefruit Lip Butter as much. I really wanted to love this. The scent is sweetly delicious, and the texture is much much creamier than Lip Butters of yore. They must've changed the formulation -- gone is the crumbly dry mess that used to be the lip butters. The new and improved version is smooth and almost whipped. Sadly, this tends to leave a milky, white/pink look to the lips. While this might be a good thing for those looking to rock the Surfer-Girl chic, for the rest of us it is an unfortunate side effect. Also, this means you'll have to make sure your lips are already smooth before applying, otherwise the balm will emphasize any dry flakes. Moisturizing power is mediocre -- again, better than before, but not great, especially considering how plush the body butters are. Still, the scent is quite yummy, and for that alone I will use up my little tub. To offset all this awesomeness, the Body Shop has raised the prices for their Body Butters YET AGAIN. They're now $20 CAD a pop, up from a price increase to $19 less than a year ago. But with the Pink Grapefruit, Strawberry, and trusty Nut butters crowding the top of my need-to-have-it list, I'd better keep my eye out for those 2 for $30 sales! Bastards.